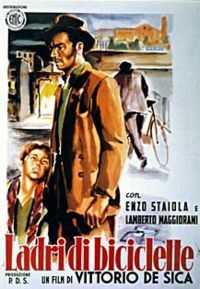 We watched The Bicycle Thieves for the first time the other night. It really hit home. At the most joyful moment of the film there’s the line “there’s a cure for everything except death”. And, at some level, you know what’s coming. And it won’t be sweet. It’s a proper February film. Last night we trekked through the snowdrifts of the Victoria Line to The Almeida to see Frank McGuinness‘s new play There Came A Gypsy Riding. Here too the ruffian wouldn’t lie down and go away – there are no resolutions, no resurrections. A strange play that changes gear in its second half, perhaps because it won’t deliver an easy answer. There is no communing with the dead for the characters who have moved away / moved on up – it’s no longer an option. Perhaps this is too personal a take on the play. I’ve made it sound dark and worthy, but it’s uproariously funny in places and the performances are a joy. David Eldridge writes about it in a much more measured way here. On a lighter note (and god knows this post needs a lighter note) Eileen Atkins plays the role of Bridget. Bridget is a madwoman, a seer, a liar, a devil and a manipulator – it’s a great role and played to the hilt by Atkins. Anyway, Bridget seems like a far-fetched character, but P assures me that she’s the spit of a relative of hers. PS Frank McGuiness wrote one of my 137 Desert Island Plays: Observe The Sons Of Ulster Marching Towards The Somme. PPS Off to the New Writing Forum at The Royal Court tomorrow, ‘Arctic conditions’ permitting. Posted on February 9, 2007, in film, theatre. Bookmark the permalink. Leave a comment.